Curl bars, often referred to as EZ bars, are long bars that have angled grips in the middle. Like regular barbells, curl bars are available as a standard or Olympic bar. Unlike regular barbells, Olympic curl bars do not have specific dimensions and weight. They vary in size and weight depending on the manufacturer and the model. An Olympic EZ curl bar is longer and heavier than a standard curl bar. Both styles have angled grips. 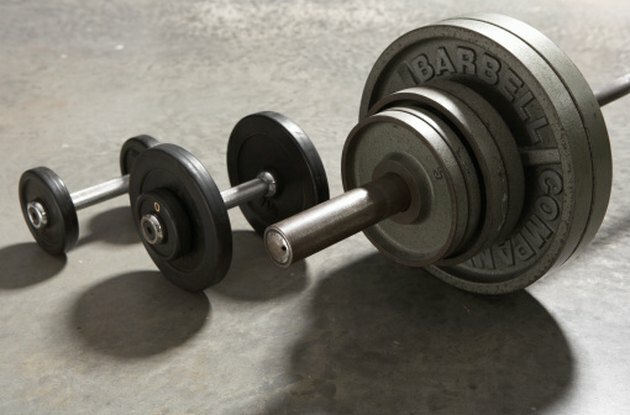 Curl bars are most often used for bicep curls, hence the name of the bar. You can also use them for rows and tricep extensions. According to the National Strength and Conditioning Association, some users find the wrist position with a curl bar more comfortable than a straight bar. The angled grips allow your hands to be turned slightly, placing the wrist in a more natural position. Olympic barbells have specific size and weight standards. This is because they are used for the sport of Olympic weightlifting. Olympic EZ curl bars, although larger than standard curl bars, do not have any weight or size specifications. They are not used in any official sport capacity, so standardization is not necessary. Different manufacturers make EZ curl bars in a range of lengths and weights. You have to use Olympic weight plates with an Olympic EZ curl bar. The bar has 2-inch sleeves, so only 2 inch, Olympic plates fit. Standard plates have 1-inch centers to go on standard, 1-inch barbells. A typical Olympic curl bar is 47 inches long, although some are up to 52 inches long. The weight of the bars ranges between 18 and 25 lbs. A standard curl bar is much lighter, between 11 and 13 lbs. Olympic curl bars have rotating sleeves at the ends. Standard curl bars do not. The weight plates on a standard barbell place stress on your wrists and forearms. As you move the barbell, the plates want to spin, but can't. This results in a constant pressure pushing against your hands. The rotating sleeves on an Olympic curl bar allow the weights to freely spin. This reduces the torque stress on your joints. How Much Weight Should I Curl on a Two Armed Curl Bar?